... please let me know of any corrections or other issues. Results will be sent to RUSA later this week, and then become final, pending RUSA & ACP approval. Temperatures at the start were above the freezing mark at 36 F, and rose steadily to 50 F which maintained throughout the afternoon and evening hours. In fact, at midnight Saturday the local temperature in Reading was 53 F, unheard of for the first of January! The sun was out early on, then became increasingly overcast to maintain the comfortable - or for some overdressed riders - balmy temperature. The winds were calm initially, with a slight southerly breeze developing later on to welcome the riders home. 17 of the 19 starters made it around the course within the time limit (including Mark Kaufman and me who did the volunteer pre-ride two weeks prior), for an 89% completion. Ixsa Gollihur and Bill Reagan, who bravely rode over 50 miles in the arctic conditions of last years PAD, completed the entire course together this time around, although arriving one-half hour behind the limit. Arranging a brevet on a holiday can present challenges with businesses operating on Holiday schedules, and this was no exception. Despite the best efforts of Mark and I to obtain direct confirmation from the owners and staff that the Subway in Columbia and the Cafe Chocolate in Lititz would remain open on New Years Day, for whatever reason this was not the case. The outstanding quick efforts of Mark Kaufman in relocating the Columbia controle to the nearby Turkey Hill, and Andrew Mead (assisted by Curtis Palmer & Jack Bingham) in relocating the Lititz controle to an open pizza place a few doors down, resulted in minimal disruption for the participants. This made for an especially long day by Mark, who swept the riders through at Columbia, then later relived Andrew and company to greet and report on the remaining riders progress through Lititz. My congratulations go out to all of the riders once again for their effort and teamwork, as especially exhibited by Ixsa & Bill in traveling and completing the course together. And for the volunteer commitments demonstrated above in managing the controles - well done! Of course, with my wife Lora Beth out of town, I would have been lost without the overnight and all-day assistance of Ron & Barb Anderson here in Reading! Barb and Ron were there to help register riders at the ride start, assist me with food preparation, and in greeting the returning riders at the post-ride celebration (which lasted well into the evening). Thanks a bunch you two! Of special note, Nigel Greene, Tom Reeder, and Bill Russell successfully completed their first Eastern PA Brevet on this ride, with Tom coming north to visit from Alexandria VA, and Bill visiting our "balmy" weather from his icy home in Martha's Vineyard MA - Thanks for joining us! And once again, the combo team of George "Baggy Jeans" Metzler & John "Fair Weather" Fuoco rocked the course with a new course record time of 9h 00m. Not bad for a ragged pair of Pennsyltuckians, and so apropos a title for George to hold; one of our "token" Dutchmen. And as George and Mike Lutz are reportedly heard to say, "If you ain't Dutch, you ain't much!" As of this posting, a few rider comments were received. Please feel free to submit any you may have, and I'll add to this segment. 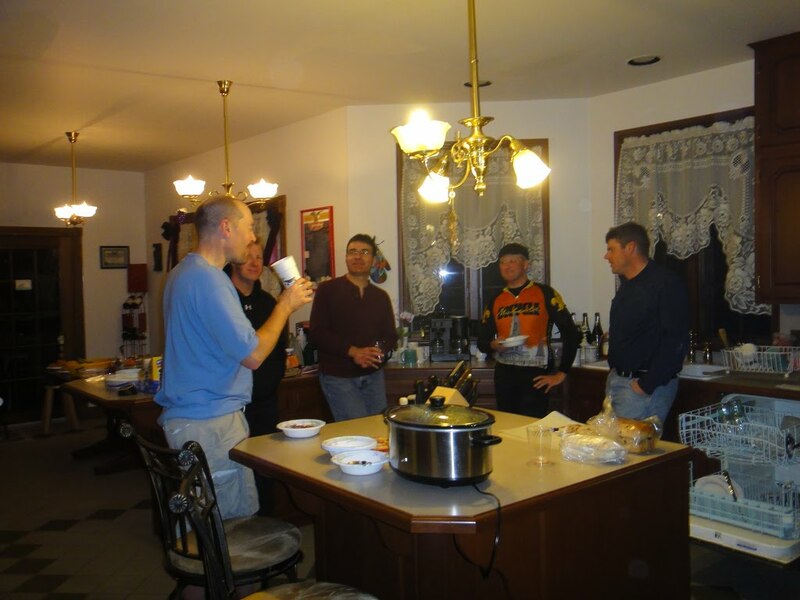 "Hey, thanks again for all that you've done in organizing the New Years brevet. From the opening of your home, to the endless correspondence, to the genuine concern for all the participants, and so much more. My experience yesterday makes for an excellent foundation in getting back into Randonneuring. Your efforts, along with Ron and Barb Anderson's, Mark Kaufman's and Andrew Mead's demonstrate everything that is right about this aspect of bicycling and that past negative experiences with motorists aren't going to keep me from participating in it. Thank you all!" "Rick, Thanks to you and the volunteers for a great (and challenging!) ride yesterday. It was a lot of fun, and a wonderful way to start the New Year. Great to meet you. Thanks again! -- Joe"
"Yes, great job. I expected we would be on our own. It was nice to see volunteers at the closed controls. I hope we didn't p*ss off Rick's neighbors! It was really nice of Rick to host us from his house. P.S. Rick, I stopped in Philipsburg on the way out, and I see why you like Cycle Funattic. It's probably the only place around that has more Bianchi's than your garage!" "I wanted to thank Rick and the volunteers for staging a great event. Having just completed my first eastern PA Randonneur ride, I can now see why you get such a strong year round turn out for courses whose reputation for difficulty precede them. From the warm greetings on my arrival at the start, the friendly riders on the course, the helpful volunteers at the controles, to the delicious food and warm welcome on the return, the people involved made it a very memorable day. Add to that a course that was scenic, low traffic, and challenging (without being brutal), and you have a combination that made an excellent day of riding. Look forward to riding with the group again. Thanks!" Did you find Doug? :-) Thanks again for all the food and organizing great support for the day"